The Brisbane River, referred to by locals as the "brown snake", has long been known as a home for many creatures great and small. During the warmer months, rumours of fishermen catching metre-long bull sharks swirl around the city. Kelly Harding, who recently moved from Darwin, said while she was accustomed to crocodiles in the waters up north, she wondered if there were many sharks in the river. "I had heard from a few people that there are heaps of bull sharks and I had never seen anyone swimming in the river," she said. "I enjoy walking along the river with my dog and I was curious to know if there was a random few or dozens beneath the surface. "I haven't seen any from the banks around the Riverwalk but wondered if it's safe for my dog to go for a swim." It's a question that's been posed to Curious Brisbane many times over the past six months. Queensland Museum ichthyologist Jeff Johnson said bull sharks were a common resident of the Brisbane River but population estimates varied wildly. "Research done in the river about a decade ago put an estimate on the number of bull sharks in the river between 1,000 and 3,000," he said. "More than 98 per cent were thought to be juveniles between one and six years old. "There certainly are bull sharks in the Brisbane River, and are often seen up in Colleges Crossing [near Ipswich]." Mr Johnson said the juvenile sharks ranged in length from 60 centimetres from birth up to 1.4 metres. "Female bull sharks can give birth to between one and 13 young. "The large sharks are often found at estuary mouths, but you will find them right out in Moreton Bay and near Tangalooma — right up and down the coast. "The smaller ones go upstream to get away from larger ones to avoid being eaten." They had a broad diet, he said, usually looking to prey on schools of mullet, bony bream, gar, forktail catfish and eel. Mr Johnson said bull sharks lived in temperate areas and could be found from the Swan River in Perth across northern Australia and south to Sydney. "They are more active in the warmer months between October and early May," he said. During winter the sharks often move downstream in the Brisbane River. "The sharks follow the mullet schools, and mullet migrate out to sea to spawn when the first westerly winds come in May and June," Mr Johnson said. "Around the mouth of the river they are often caught in fishermen's nets, but in the warm months they are more active in the river itself." In 2017 a group of young Brisbane rowers had their scull bitten by a shark near the Kurilpa Bridge in the CBD. Commercial Rowing Club coach Peter Toon told ABC Radio Brisbane that large teeth marks were left on the craft. "[A rower] saw the fin and [the shark] went around and gave a big snap on the stern of the boat," he said. "I've been coaching for more than 25 years and I've never heard of an incident where a bull shark has attacked a rower." Bull sharks inhabited estuarine areas, Mr Johnson said, which raised the possibility of interactions with humans, making them dangerous. "By number of attacks they are often rated as the third most dangerous in the world. "There has certainly been fatalities and they have a large powerful set of jaws and a robust set of triangular teeth that can do a lot of damage." But he described bull sharks as inquisitive creatures and usually quite harmless. "When they bite they're not defending territory but undertaking a test bite." He explained the murkiness and lack of visibility in the Brisbane River meant that any disturbance attracted sharks. "They will come to investigate a disturbance to see if it's a fish in distress or another creature there that could become its next meal. "If someone is paddling in the water or splashing, they will come up and most of the time they will have a look and see it's not a mullet and be off." Local fisherman Richard Smith said bull sharks had been caught along the length of the river and had been targeted for sport and catch-and-release. "Because bull sharks are a fast fish, it's an exciting fish to catch and it's a game fish for your average person to chase with inexpensive fishing gear," he said. "I catch them from a kayak and there is definitely adrenalin that goes with it." The avid angler said the largest shark he'd landed in a kayak was 1.2 metres long. "I have lost sharks larger than that in the river, but the largest I know of was three metres long," Mr Smith explained. "At three metres long, they are an incredibly powerful and aggressive animal, but many people don't realise though that you can't keep sharks over 1.3 metres long." 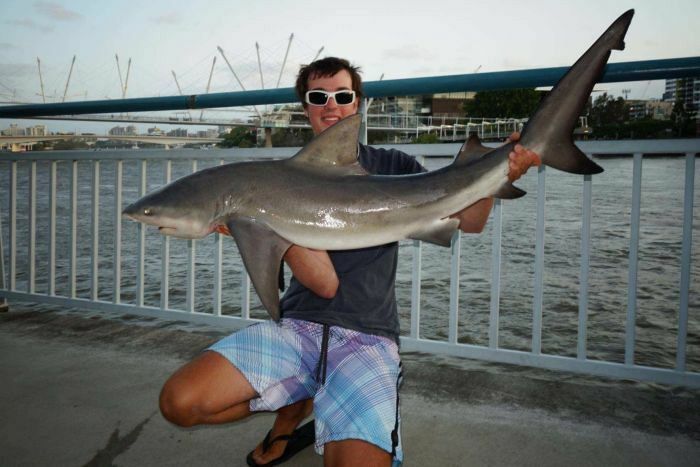 Bull sharks have also been caught by fishermen in the city reaches of both South Bank and the Story Bridge. Mr Smith said while Colleges Crossing was a popular spot, he did most of his fishing near Jindalee and Fig Tree Pocket. Bull sharks can travel long distances in fresh water, with many moving 90 kilometres upriver to places west of Ipswich. Luckily the weir at Mt Crosby stopped the sharks going further as they cannot traverse the fish ladder. "In times before the weir was built, bull sharks were found as far up the river as Lowood not far from Somerset Dam," Mr Johnson said. One of the most exciting attributes of the bull shark was its ability to become airborne. "I have seen them clear the body-length of water in the Brisbane River; it's quite a spectacle," Mr Smith said. "It can be incredibly terrifying if you're in a kayak though, as you don't want one in the kayak with you." So, with sharks up and down the river, is it safe for dogs to wade into the water? "I would leave Rover out of the river as bull sharks would take a small dog if they were a decent-sized bull shark," Mr Johnson said. "Most of the sharks in the river are relatively small ones and they would much sooner go for a fish rather than a dog." Mr Smith agreed, especially for people visiting Colleges Crossing. "There are so many sharks in that area — there is no way I would let my dog off or go swimming in that area," he said. Both the Ipswich and Brisbane City councils warn locals to keep pets out of the water.